If your archives has limited resources and lots of collections that need attention, how do you decide which ones to focus on? In the HSP Archives Department, one of the main tools we use is the HSP collection survey methodology, which has become a model for collection assessment work at dozens of institutions around the U.S. In this blog post I’d like to give an overview of our survey method — how it works, how we use it, and where we’re headed with it in the future. The HSP survey methodology uses a combination of qualitative and quantitative measures to assess collections. Each collection is rated on a 1-5 numerical scale for physical condition, quality of housing, physical access, and intellectual access, with 5 being the highest. A research value rating is determined by adding together separate 1-5 ratings for a collection’s interest and documentation quality. Surveyors also record notes that provide substance and specifics to help explain the numerical ratings. Numerical survey ratings enable us to set priorities across all of our archival collections. Generally speaking, a collection that gets a high research value rating (7 or above) and low ratings for physical condition, housing, and/or access is a high priority for processing (and in many cases for conservation work). This helps us pick collections to include in grant proposals, feature in our Adopt-a-Collection program, and assign to staff members and interns. We don’t rely on ratings alone to make these selections, but they are a starting point. Querying the survey numbers usually turns up some high priority collections that are already on our radar, but there are often some surprises as well – collections that have lots of potential but haven’t gotten any attention since they were surveyed years ago. I used to think HSP didn’t have any sports history collections to speak of. Then I crunched some survey numbers and rediscovered a 100-linear foot collection that documents the development of a local tennis tournament into an international event. The HSP survey methodology was developed by David Moltke-Hansen, who was HSP’s president from 1999 to 2007, and Rachel Onuf, who led a Mellon-funded project to survey HSP’s manuscript and graphic collections in 2000-2002 and then headed HSP’s Manuscripts and Archives Department until 2004. 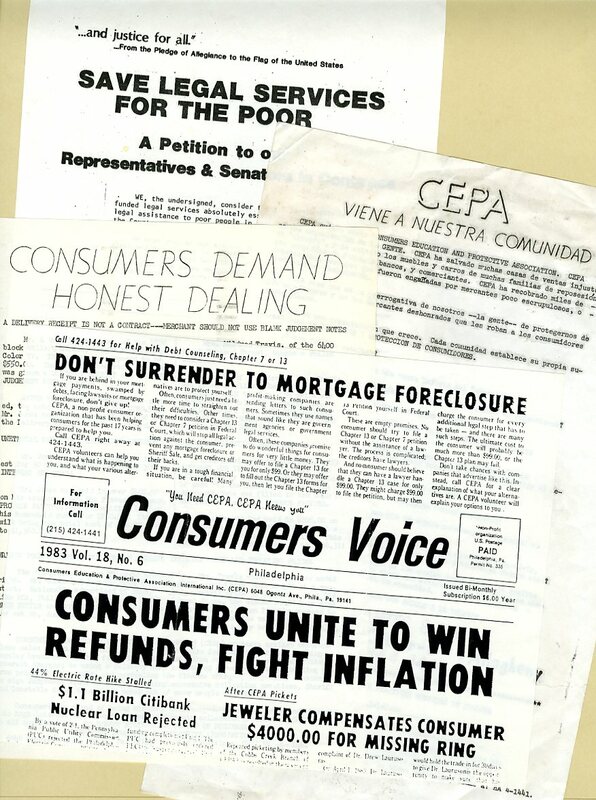 Since then, the Mellon Foundation has funded survey projects based on the HSP methodology by Columbia University, the University of Virginia, the Philadelphia Area Consortium of Special Collections Libraries (PACSCL), and the Black Metropolis Research Consortium (BMRC) in Chicago. 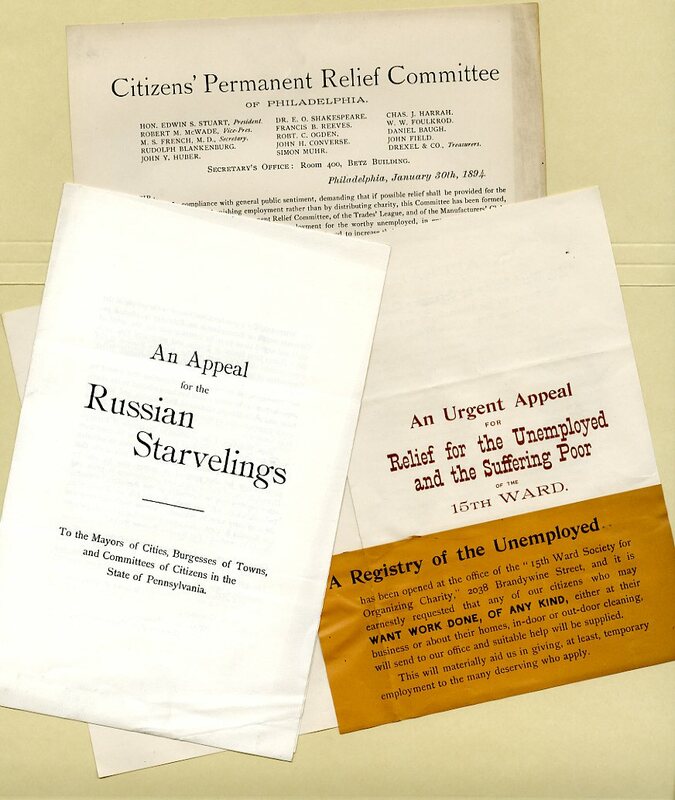 Other institutions that have conducted collection surveys based on the HSP method include the University of Massachusetts-Amherst, the Chicago History Museum, and Penn State University (for a survey of Civil War homefront collections at small repositories around Pennsylvania). Each of these institutions has adapted or modified the survey method to some degree to meet its particular needs. In 2009, the developers of Archivists’ Toolkit, an open-source archival collections management database application, added an assessment module based closely on the HSP survey method. This made it possible for HSP to begin shifting our collections management data from our old MS Access database to AT. 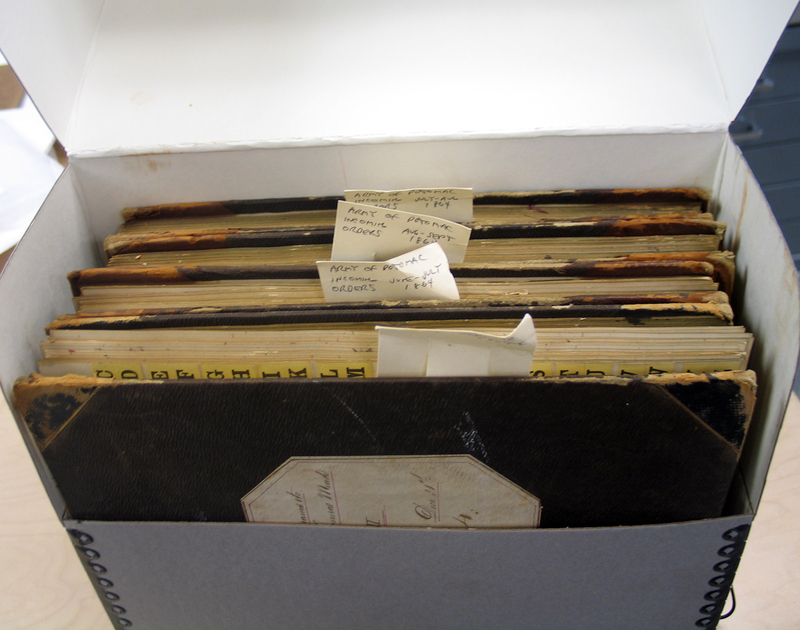 At HSP, we have attempted to make surveying an integral part of the accessioning workflow. This has not always been successful, mainly because of lack of time, but after a hiatus we are back to surveying regularly and chipping away at the small backlog that has built up. Currently, each new collection larger than 1 linear foot (and some smaller ones) gets surveyed within a couple of months after it is acquired. Cary Majewicz (HSP’s technical services archivist) and I do the surveying together as a team. Sometimes we invite other staff members or interns to join us, both to get the benefit of their knowledge and expertise and to help more people understand the survey methodology and its uses as a collections management tool. Over the past couple of years we’ve made a couple of small additions to the survey protocol. First, we added a numerical rating for “Recommended Processing Level,” to represent our five possible processing levels, from basic collection-level record (Level 1) to full-scale traditional processing (Level 5). (We developed this five-tiered processing schema starting in 2007 based on “More Product, Less Process” principles.) More recently, we started including a processing cost assessment as part of the survey record for all collections that get a research value rating of 6 or higher. This makes it easier to plug these collections into our Adopt-a-Collection program [link]. HCI-PSAR surveying began this week at the Byberry Library in northeastern Philadelphia. We’ll be featuring reports on this work both on Fondly, Pennsylvania and on a new project blog to be launched soon. We expect that the HSP survey method will need to be further adapted to address the particular circumstances of non-professionally run institutions, especially given the lack of standard archival management practices. (For example, are materials even divided into discrete collections?) It will be interesting to see how this unfolds. 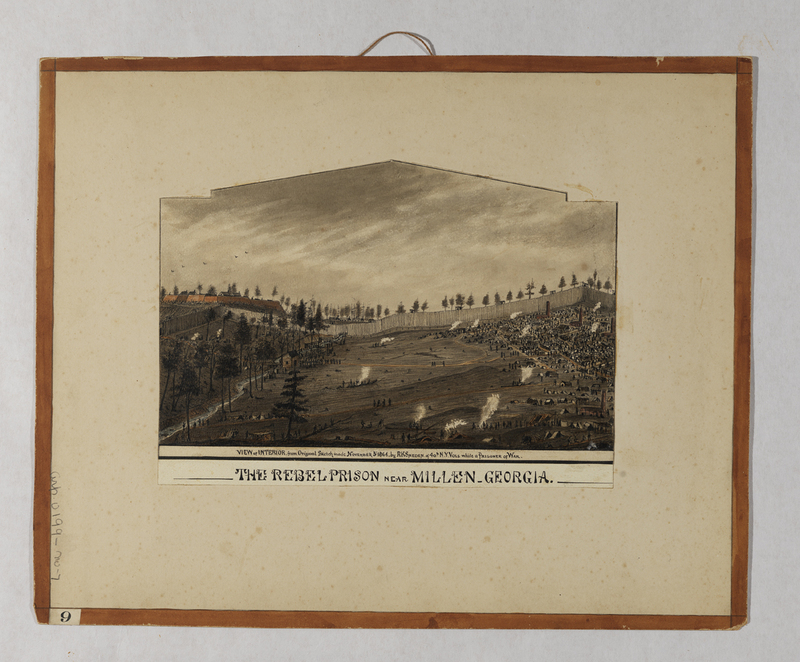 Archaeologists in Georgia announced yesterday that they have found the site of Camp Lawton, a Confederate prison camp near Millen, Georgia. You can read more about the project at Georgia Southern University’s Camp Lawton web site. 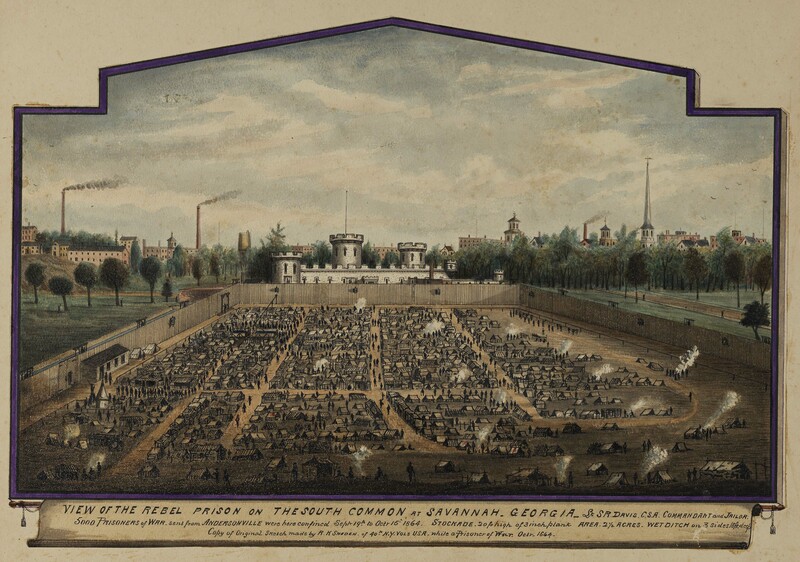 As you may remember, we processed a collection earlier in the Digital Center for Americana project that included images of Confederate prisons. Previously absent from HSP’s catalogs, the collection is now titled Sketches of Confederate Prisons (drawings) by Robert K. Sneden (Collection 3129). For more on HSP’s collection of Sneden sketches, check out Cathleen Miller’s earlier post. 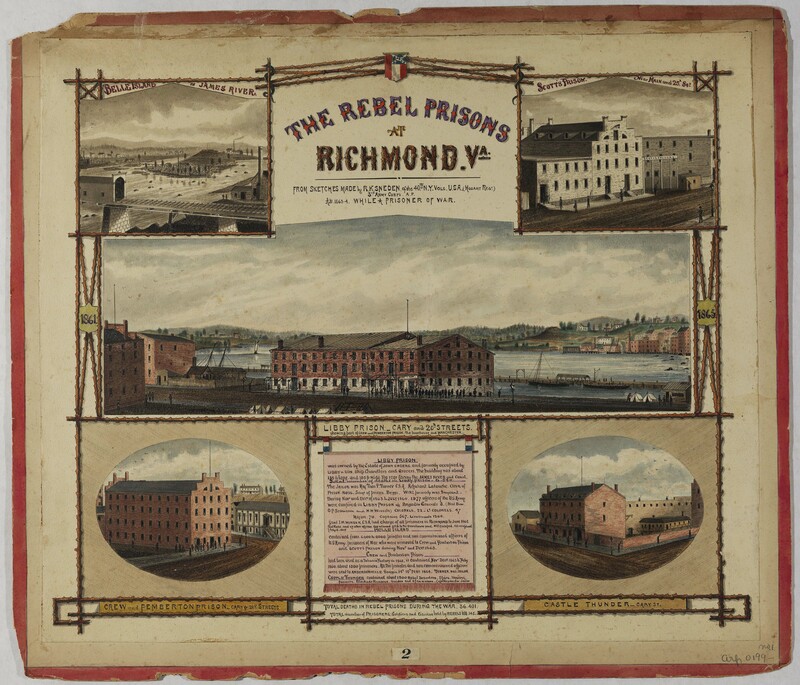 Early on in the Digital Center project, I worked on a description for the Robert Knox Sneden collection of “Sketches of Confederate Prisons.” I discovered that not only did this collection have an obsolete call number, but it was not listed in either our OPAC or our graphics card catalog. 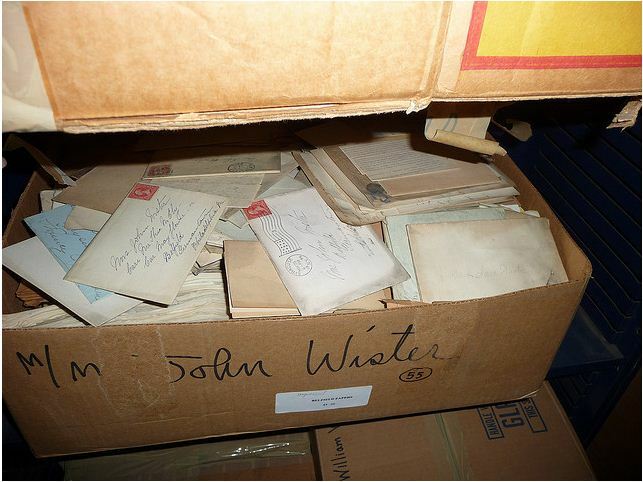 The only way to find this collection was by searching our Access database. This still remains true, and will until we import our database into Archivists’ Toolkit sometime toward the end of the DCA project. It pains me to know that little gems like the Sneden drawings are unknown to researchers, so I thought I could at least add a little plug for it here until it gets an OPAC record and is visible in our still-in-progress DAMS. 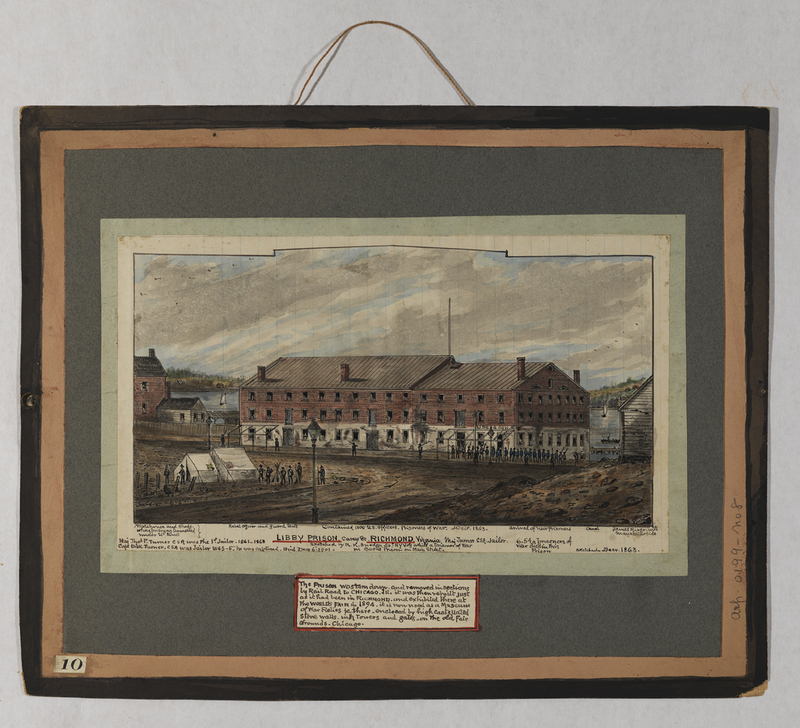 This collection consists of eight mounted wash and ink drawings of Confederate prisons by Robert Knox Sneden during his service with the 40th New York volunteers during the Civil War. 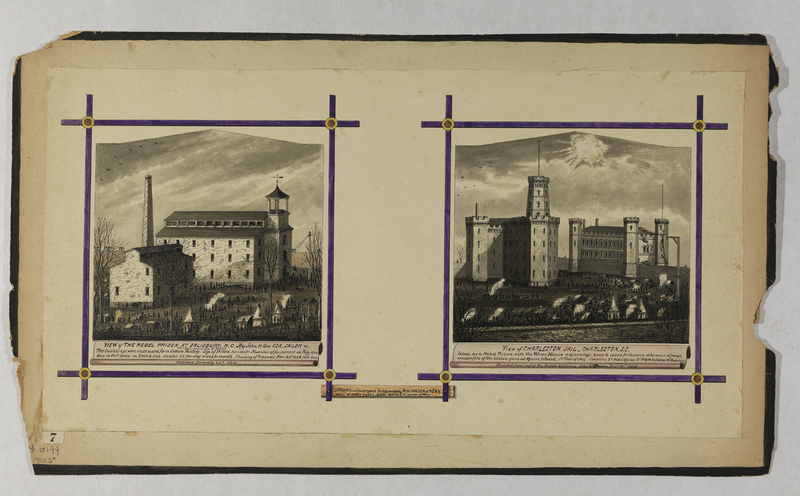 Each is captioned, identifying the prison, describing the site, listing the number of prisoners, noting how many deaths occurred there, along with the date when he was imprisoned there. 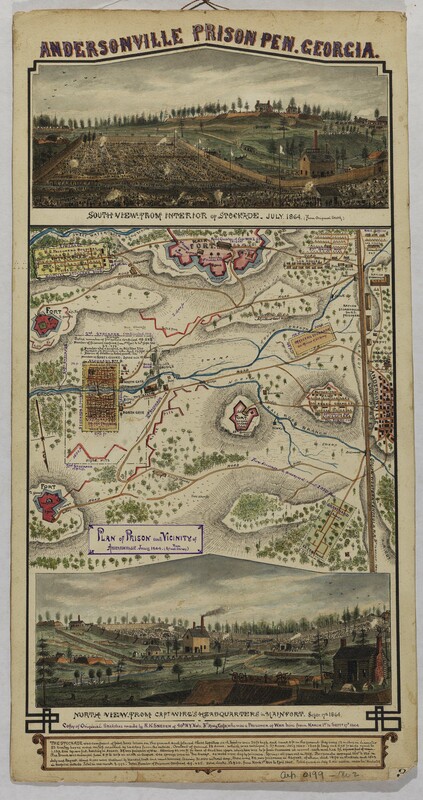 The watercolors are copies of original sketches done by Sneden while in the service. They offer extensively detailed perspectives on the prisons, and suggest the difficult conditions within the walls of the buildings Sneden illustrated.